Watch for it! On Sunday, March 18, 2018 a giant cotton swab will wind its way from Brooklyn, across the Manhattan Bridge, and through Times Square before finishing the race in Central Park, carried the entire 13.1 miles by Gift of Life marrow donor Guy Felixbrodt. Guy is running the half-marathon in support of the organization and expects many people to see the swab, read his shirt, and learn about the power of each person to cure someone with blood cancer. He’s also hoping that many people will sponsor his run, because every $60 he raises will add a new donor to the registry. Guy joined Gift of Life in June 2010 while attending a Jewish educators conference at a synagogue in New York City. Five years later, he was found as a match for a 43-year-old man battling non-Hodgkin’s lymphoma. “I was excited to become a donor and have the opportunity to help another human being in such an amazing way,” said Guy. So much that he started to write about his donor experience on Facebook. You can read his entire story – from learning he was a match through the donation process – on his Guy’s Gifts fundraising page. After a test to confirm that he was the best match for the patient, Guy began preparing to donate peripheral blood stem cells (PBSC). Wanting to give his recipient the best chance possible, he set out to give him the healthiest stem cells he could. For the month before he donated, he stopped eating sugar, began jogging again and took up swimming. When he informed his workplace why he might need a few days off, they told him that saving a life was the greatest mitzvah (good deed) in the Jewish faith, so whatever they could do to support him would be their honor. On his day of collection he brought three drawings made by him, his wife and his daughter symbolizing peace to help him focus his thoughts, and in the hopes of sending them to the recipient. Since only the stem cells could be transported, Gift of Life later forwarded the drawings to the transplant center to pass on to the recipient’s family. Donors and recipients must remain anonymous during the transplant process and for one year afterward. After donating, Guy decided to continue his healthy regimen and participate in a “swim-across-the-Hudson” event, adding a bike ride and run to make it a triathlon. 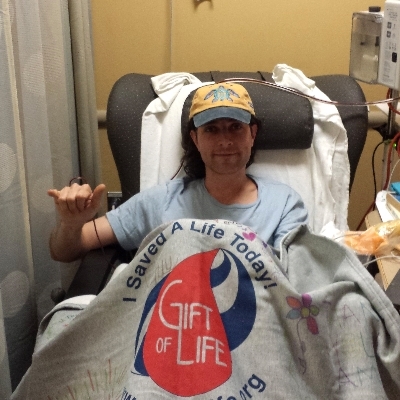 A few months later, Guy got an unexpected call from Gift of Life: he was asked to donate to the same patient again, and gave a second round of PBSC in the hopes of helping him recover. Unfortunately, the patient did not make it. Every one of us has the power within to possibly heal someone else. The more donors we add to the registry, the more matches will be found and the more lives will be saved. Sponsor Guy’s run and join the fight to cure blood cancer. Guy is the Executive Director of J-Teen Leadership, a program to empower and inspire Jewish teens through leadership training, service trips, advocacy and philanthropy. He is a former Israeli Naval Officer, and lives with his family in Beacon, N.Y. In his free time he runs, bikes, swims and juggles.